During an eight-day stretch, a small group of parents and children repeatedly occupied the office of Hawaii Governor Linda Lingle, trying to draw attention to the teacher furloughs that have closed public schools for 13 Fridays since last fall. The families did homework together, made posters for their cause and five times stayed overnight. The protesters said they represented Hawaii's parents who have grown increasingly frustrated with the furloughs, which have given Hawaii the dubious distinction of having the U.S.'s shortest school year  163 days. The furloughs are part of Lingle's solution to a projected budget deficit of nearly $1 billion. Liam Skilling says he and other protesters felt they needed to occupy the governor's office to make a stand because so many in the state were beginning to accept the furloughs as normal. "What we're fighting for now is so simply right," Skilling says. "We're fighting for our public-school system." Lingle initially seemed to tolerate the occupation, which began on April 7. But sheriff's deputies quickly began issuing trespassing citations to protesters. Some got multiple citations, particularly for staying on the premises after office hours. Then, during a press conference at her office on Wednesday, April 14, the governor ignored questions from parents and warned that anyone who had already been cited twice would be arrested. Later that night, two people were taken into custody. The following day, two more were handcuffed and led away. 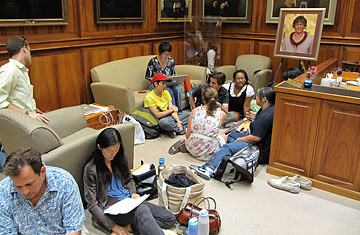 The arrests have forced the protesters to abandon their sit-in in the latest chapter in Hawaii's months-long "furlough Fridays" saga. Nearly 170,000 students statewide have been affected since the program began last October. There are four more Friday closures planned before the school year ends in May. "While we're disappointed, we take away a victory  that the eyes of the world were focused on the failure of furloughs," says protester Clare Hanusz. "We're disgusted with the governor and her leadership, and we'll be focusing our efforts elsewhere. That doesn't mean we won't come back. Our resolve is strengthened." The furloughs were announced Sept. 21 as part of a contract settlement between the state and its public teachers' union, the Hawaii State Teachers Association. The furloughs have proved a hardship for parents who, with family budgets already constrained by the recession, can't afford day-care costs of $25 to $50 a day. While the governor's office became the stage for much of the drama, state lawmakers worked to fund the education budget in order to do away with the furloughs. But negotiations that involved the governor, the teachers' union and the state board of education have gone nowhere. At one point, Lingle proposed $62 million to close the gap, but the union and board say that any solution will cost the state $92 million. The Democratic-controlled state legislature ends its 120-day session on April 29, but lawmakers fear that even if the funds are allotted, Lingle, a staunchly antiunion Republican, might refuse to release them. On Sunday, April 11, she called the protesters "misguided" and said they should be obtaining concessions from the teachers' union, not her. "This is a black eye on public education in Hawaii," says state representative Marcus Oshiro, a Democrat who chairs the House Finance Committee. "Parents are upset and understandably so, and that's frustrating."